FDS Super Mario Bros. 2 (JPN) "warps, Mario" in 08:05.28 by HappyLee. 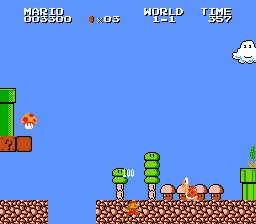 Mario has eaten too many poisonous mushrooms and as a result, decided to go on a furious killing spree. In this berserker state he has also gained the new secret ability to walk through walls at will. Wondering how some tricks work? Information is available at Super Mario Bros. Tricks page. This movie is 1.68 seconds faster than the previous version due to new routes in 1-1 and 1-2. This is the real Super Mario Bros 2. It was never officially released in the USA and Europe. It was later ported to SNES, and released as "Lost Levels" on Super Mario All-stars. FDS means Famicom Disk System. It was a Japanese disk-unit version of the NES.